VPNs are a great and easy way to protect your online activities from hackers and spies while accessing geo-restricted streaming and web content. How do NordVPN and PureVPN stack up? Read on to find out more! The internet has given users worldwide access to unprecedented capabilities, but it has come at a cost. People are more exposed than ever to cyber attacks and identity theft. However, using a VPN greatly reduces the risk of falling victim to identity theft, and lets consumers connect to websites and services they wouldn’t otherwise be able to access. 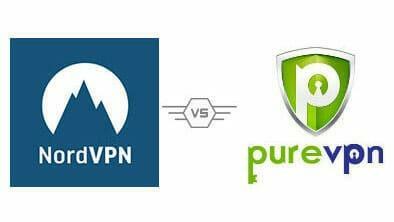 Our team of experts has embarked on a VPN comparison to see how the top contenders measure up against each other. Today, we’re looking at NordVPN and PureVPN, and putting them through our gauntlet to find a winner. Let’s see how they do! When we conduct a new test, each company is closely examined according to our strict standards. These include server availability, security protocols, speeds, and other important aspects. A VPN must give users choices for connecting, both in the way of servers and compatibility with different operating systems. NordVPN owns more than 2,600 servers and supports apps for Chrome, Linux, Windows, Android, Mac, and iOS. In addition, the service allows users to simultaneously connect up to 6 devices. By comparison, PureVPN boasts over 700 servers, slightly under their rival, though they add compatibility for Amazon Fire, SmartTV, routers, gaming consoles, and more. Additionally, clients are able to log on from 5 devices at once. Available Streaming Services. If you want to bypass geo-restrictions for streaming services, a VPN is necessary. NordVPN enables its users to watch content Netflix, BBC iPlayer, and a few other services. PureVPN on the other hand doesn’t support Netflix, but adds access to YouTube and ESPN in addition to BBC, Amazon and other streaming services. Mobile Apps. Mobile connections are not safe from hackers and snoops, so a VPN can protect your identity no matter where you’re browsing from. To combat this threat, NordVPN and PureVPN have apps available for both Android and iOS devices. Protocols. Each brand offers different encryption protocols to give users the ability to determine their own privacy settings. NordVPN utilizes IKEv2 and IPsec combined with open source software whereas PureVPN serves a bigger variety of protocols such as SSTP, PPTP, L2TP, OpenVPN, IPsec, and IKEv2. Speed. Fast and safe should not be mutually exclusive, especially when it comes to a VPN. NordVPN is known to have some connection issues, but download speeds tested positively during our evaluation. PureVPN, on the other hand, blew out the competition and actually improved download speeds in some tests, while increasing latency only minimally. Money-Back Guarantee. Money-back policies are a great way for companies to give users the choice to try their products free of risk. NordVPN incorporates a 30-day refund policy into its service, while PureVPN limits that window of opportunity to just seven days. Zero-Logs Guarantee. Some VPN companies go the extra mile and vow not to collect any user data. NordVPN states it will not copy, store, or keep tabs on your transactions or activity. PureVPN was allegedly exposed for logging its users’ activities, so we suggest exercising caution with this specific brand for security-conscious users. Kill Switch. If your connection suddenly becomes unsecured, it’s important to be able to act fast to neutralize the threat, and kill switches disconnect your device immediately to limit the damage. NordVPN and PureVPN both offer this valuable feature, helping keep user activities secured. Ensuring the safety of the clients is every VPN service’s main goal. NordVPN provides multiple protocols and has been recognized for its robust security features including a kill switch option should the connection become dysfunctional. The brand abides by its no logs policy, so it will not keep records of users’ activities or transactions. PureVPN delivers similar features, but their history of tracking users’ activity may be a turnoff for some. We also compare VPN services based on how well their customer support team members address technical issues or various complaints. NordVPN’s team members are available by email, regular mail, on an inquiry form, manning the help desk around-the-clock. Although fewer options, PureVPN’s staff can be reached by email or live chat, with the latter feature proving valuable if an emergency arises. When tested, both teams offered great service and were quick to resolve any issues that we highlighted. The price tag on a service is almost as important as the service itself. Fortunately, both services are available at very affordable prices. NordVPN offers four plans, which include a 3-year subscription at $2.75 a month, a 2-year plan for $3.29 a month, a single year at a monthly rate of $5.75, or 1 month for $11.95. All plans come standard with a 30-day money-back guarantee. PureVPN costs $11.95 for a single month, 6 months for $6.99 a month, or 2 years for $3.99 a month. However, contrasting with NordVPN, they only offer a seven-day refund policy. This VPNs comparison gave us the opportunity to try out two great brands, but NordVPN takes the crown in this throw-down. PureVPN still presents a great variety of protocols available to go with its industry-leading speed. However, the combination of security, speed, and privacy guarantees makes NordVPN the clear choice. If you want to suggest the next VPN services for us to write about, leave us a comment!